Jason Kingsley seems far too relaxed about the fatal dangers inherent in his daredevil hobby. "There have been some deaths in jousting," he says. "But it is usually through inexperience, the wrong safety equipment, and a lot of bad luck combined." Putting on an exact replica of a medieval suit of armour, the 53-year-old jousts a dozen or so weekends every year. Holding a 12ft (3.7m) long steel-tipped wooden lance in front of him, he rides a stallion full pelt towards another would-be knight coming at him in a similarly determined attempt to knock him off his horse. "You are both moving at about 20mph (32km/h), so [if the other person's lance hits you] it is like hitting a brick wall at 40mph. "I have never fallen off, but I have taken three people out of the saddle. Historically people have died, and it is always the lance tip going through the eye slot [of the helmet]." Given how Jason spends his weekends, you might imagine that his day job is equally daring, that he is some sort of professional stuntman. Instead, he is the chief executive of one of the UK's largest computer games companies - Rebellion Developments. Jason set up the Oxford-based business with his younger brother Chris in 1992, and today it has an annual turnover of more than £25m. Still wholly owned by the two siblings, its best-selling titles include Sniper Elite and Rogue Trooper. For the past 17 years the company has also owned cult UK comic book series 2000 AD, and publishes a range of novels. 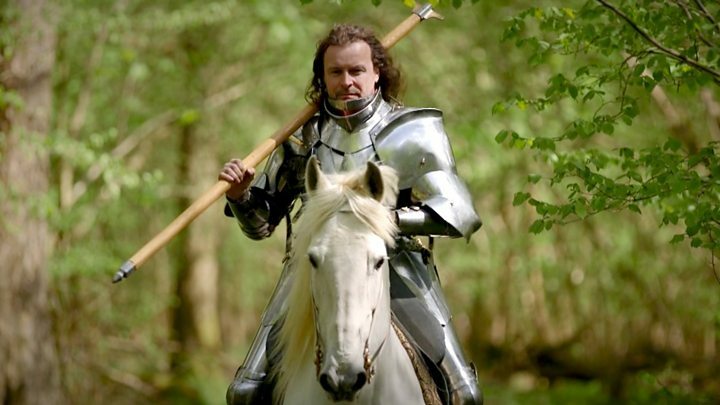 While Jason doesn't wear one of his £25,000 suits of armour in the office, he says that he tries to run Rebellion - and all other aspects of his life - according to a medieval knight's chivalric code of conduct. "What the code comes down to is try to be a decent person... and there are three parts - bravery, honesty and kindness. "In business the need to be brave is obvious; the ability to charge forward and seize the opportunity, and do the best that you can with it. "It is also about exploring new territories and seeking out new markets. It is an essential component in being a leader." He adds: "Honesty doesn't mean telling everyone your secrets, it means dealing fairly with people. "So in business, I don't try to get the best deal for myself, I'm trying to get the best deal for both sides. "This is fairer and the right thing to do, and if the other side makes a profit they will come back and work with me again. "And kindness is simply about the need to treat people well." As a teenager Jason says that he and his brother both loved role-playing games. They would sit around a table with their friends and each take on a fantasy character, such as a wizard or knight. Dice would then be thrown to determine how the characters interacted with each other, and how the stories developed. Jason also wrote a number of "gamebooks", where the reader has to decide how the story develops from multiple-choice options. Studying at Oxford University, they started to develop and programme computer games as a hobby. After they both graduated, Jason says they decided to start Rebellion "because we loved games, and we saw an opportunity in making computer games". He adds: "It really was just naivety and enthusiasm, but I think that is a really good reason for starting a business, because it is much easier to be successful if you love what you are doing." Working on a number of demo games, Rebellion got its first big break in 1993 when it won a contract from then-games giant Atari to produce the title Alien vs Predator. The game was a bestseller, and Rebellion has never looked back. After making games for other companies, such as James Bond and various titles for The Simpsons, it today tries to focus more on producing and distributing its own material. Jason says: "We knew we wanted to build up our own IP (intellectual property) and fund our own games, and that is where we are now. "It has taken us a long time, 25 years to get there... but we now come up with the ideas, fully fund the games, and release them ourselves worldwide. And that's great, there's no-one else in the loop." Profits from the computer games sales have also been used to expand the business into other areas, such as buying 2000 AD, home to cult comic character Judge Dredd. While Jason won't reveal the exact cost of the deal, he says it was "many millions". "We felt that 2000 AD was on the decline [under its then-Danish owner], and needed to be owned and cherished by someone British who knew the culture of what it was trying to do. "I genuinely think it is an important bit of our cultural heritage." Gaming industry expert Dan Maher says that Rebellion has been particularly praised for its custodianship of the 2000 AD comic book. "As the name suggests, the company prides itself on going against the grain, using the money earned from an industry driven by bleeding-edge technology to make uncynical acquisitions in the traditional publishing sector," says Mr Maher. "Such moves, driven as they are by real love and appreciation for comics and sci-fi, have earned them great respect from consumers and professionals alike." Jason has the boss role on a day-to-day basis at Rebellion, while his brother Chris holds the chief technology officer position. But before he goes to work, Jason spends two hours every morning looking after his 13 horses, and then two hours again in the evening. "Yes I could afford to get staff to do it all for me but I like doing it. The horses are my friends, my family," he says.